Unitech MS650 wearable ring scanner is an ultra-light compact Bluetooth barcode scanner, allowing you to wear it on a finger to keep both hands free for easy movement scanning. This ring scanner can read 1D barcodes and it is designed to streamline the workflow for a wide range of applications such as warehouse, logistics, retail and inventory management. • Lightweight (only 20.5g) and unique wearable ring design – Comfortable Hands-free operation. Gaining freedom of movement and improving efficiency. 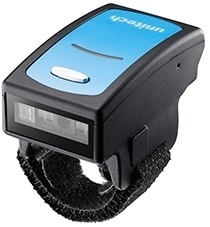 The MS650 wearable ring scanner enables its operator to move products, packages, materials and proceed with their barcode reading tasks more efficiently, safely and comfortably. The MS650 is versatile with the advantage of conducting flexible data collection operations of both on-line wireless mode and off-line memory (Batch) mode, including multiple communication interfaces (BT HID/ USB HID/ USB VCP). Radio Range - Imperial: 1-30 ft.